The Ugly Side of Retro Part Three Finale! Chaddy Daddy and I envisioned fun summer evenings working together room by room to fix up the house, maybe taking about 6 months to complete the entire project. However, our plans were dashed when we found out the Homeowner’s Insurance policy would be cancelled in 30 days due to vacancy. So we had to hit the gas and enlist the priceless help of our awesome families to fix this house up and have it rented in a month. Our budget was small beans so we had to pick and choose what to update. 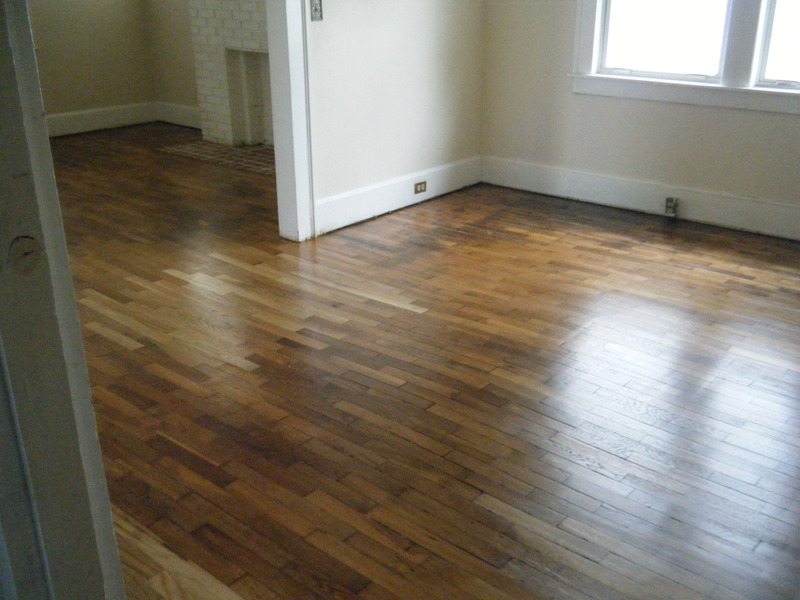 We chose the wood floors, the entire kitchen, the back den, and the installation of an HVAC system. Where to begin? 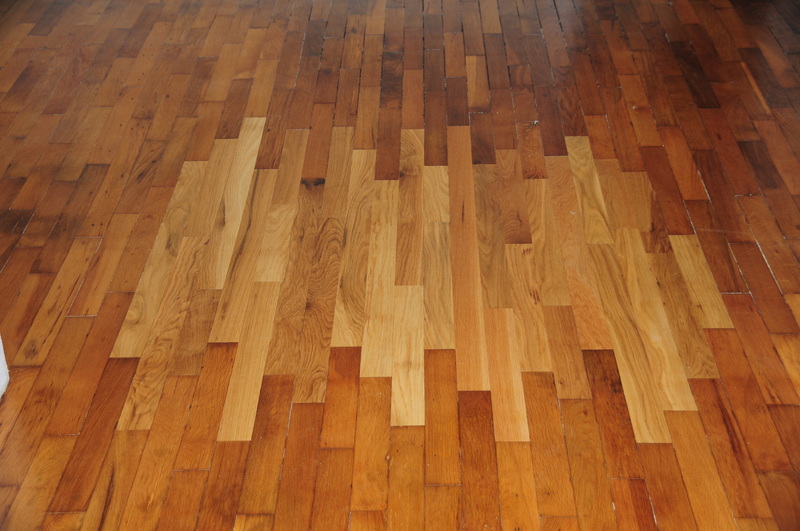 Let’s start with the wood floors. They were covered with carpet and painted white. (Why would someone paint hardwood floors??? Well, we think it was to cover up all the cat urine stains! Let me tell you, there is nothing less appetizing than the smell of age-old cat urine being heated up and sanded out of wood! Shoooo!) We pulled up the carpet and spent hours pulling staples by hand. We also took up the floor furnace and patched the hardwood before having it sanded and refinished by our handy man. 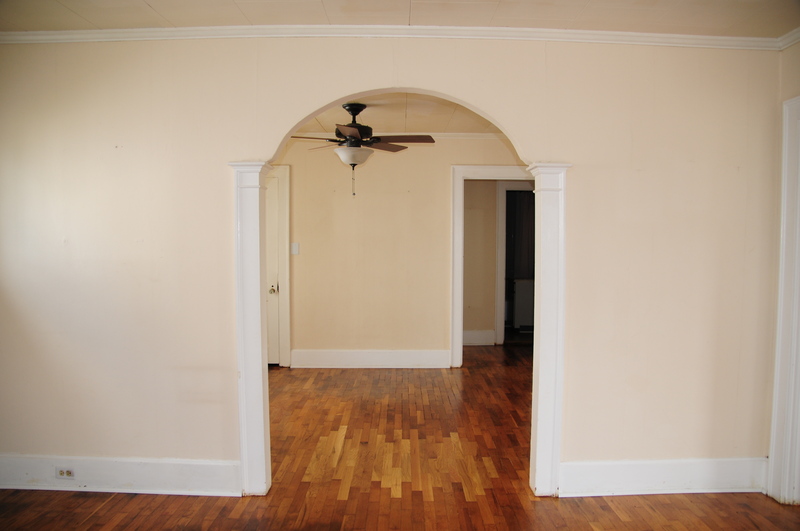 Before – Painted Wood Floors and Furnace Grate in the Middle of the Room! 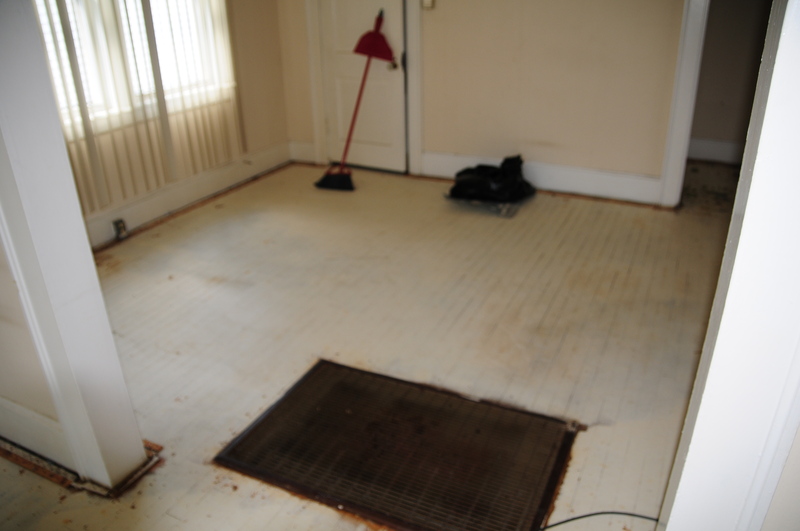 After – Furnace grate removed and hardwood patched in place. Close Up of patch work wood. The color is a little off, but this should age over time. 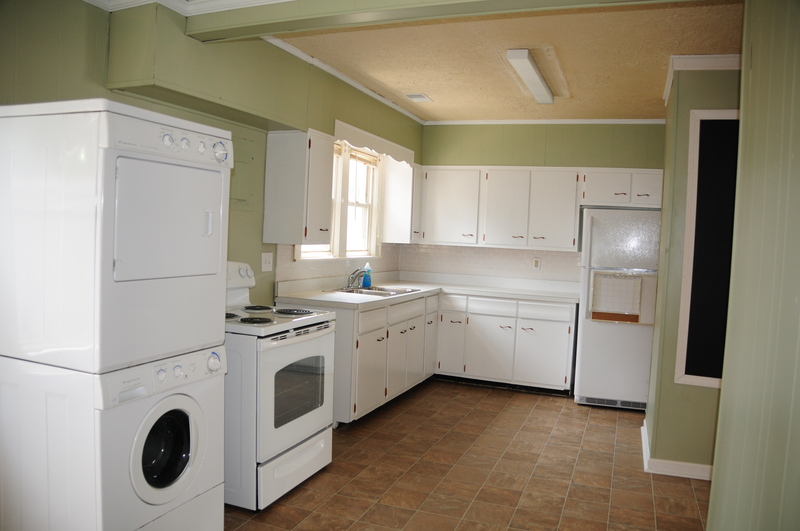 Next, we tackled the kitchen. 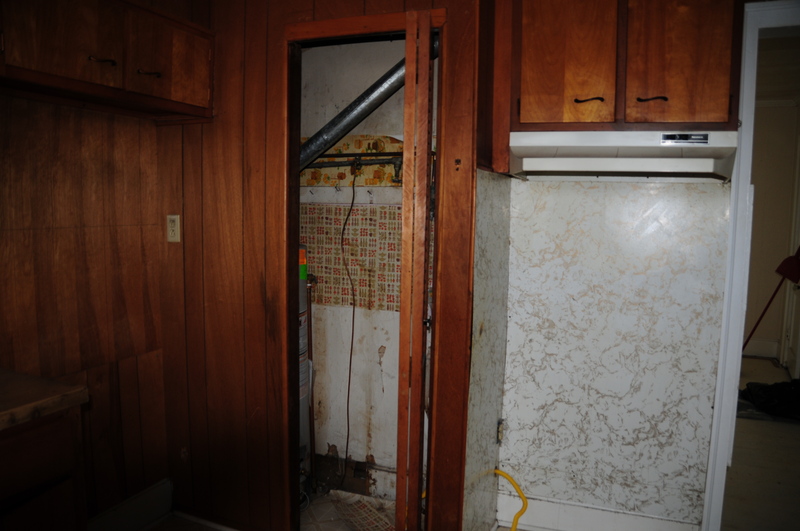 We removed an old dishwasher to reveal a huge rotten spot in the sub floor due to a long-time leak. Thanks to good ol’ Dad for making a long-lasting repair! So we decided to take up the existing linoleum and replace it with a new layer. 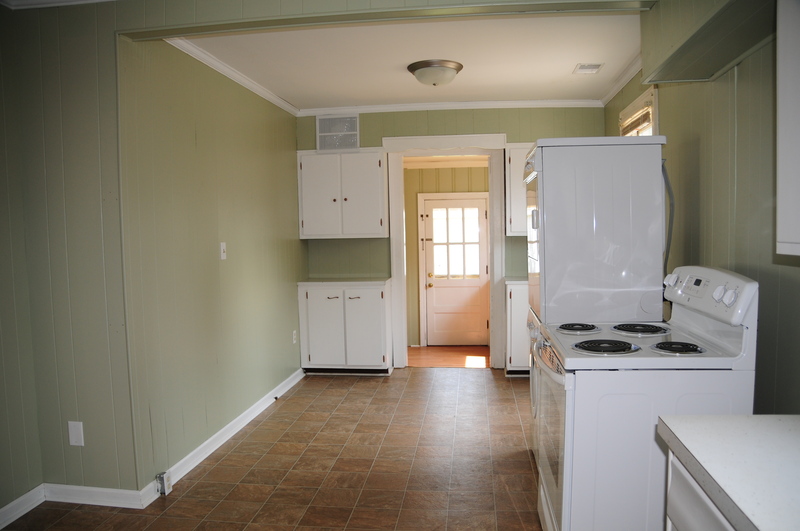 We also painted the wooden cabinets white, put in a subway tile back splash, removed a layer of nasty contact paper from the counters, painted the faux wood wall paneling, and installed all new appliances. 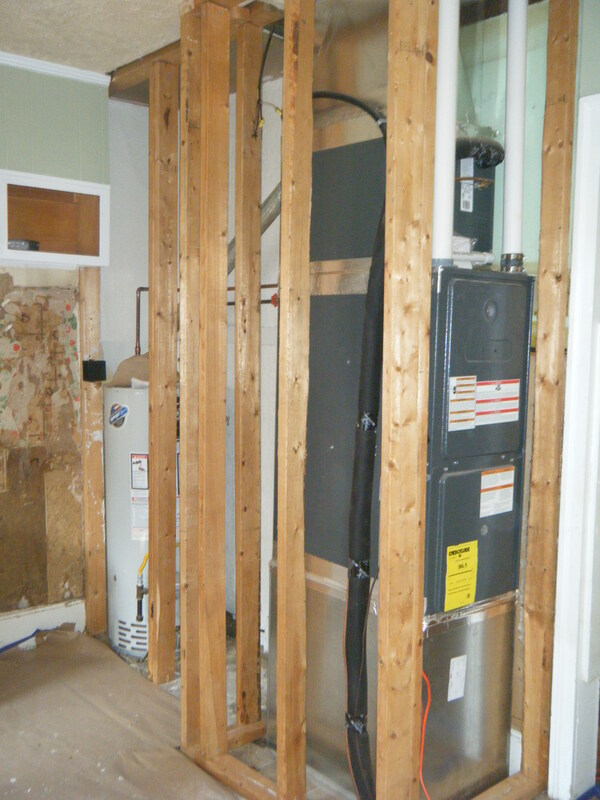 Finding a spot to put the HVAC unit was tricky, so we had to build around an area where the old stove used to be and make an access area for any future repairs. 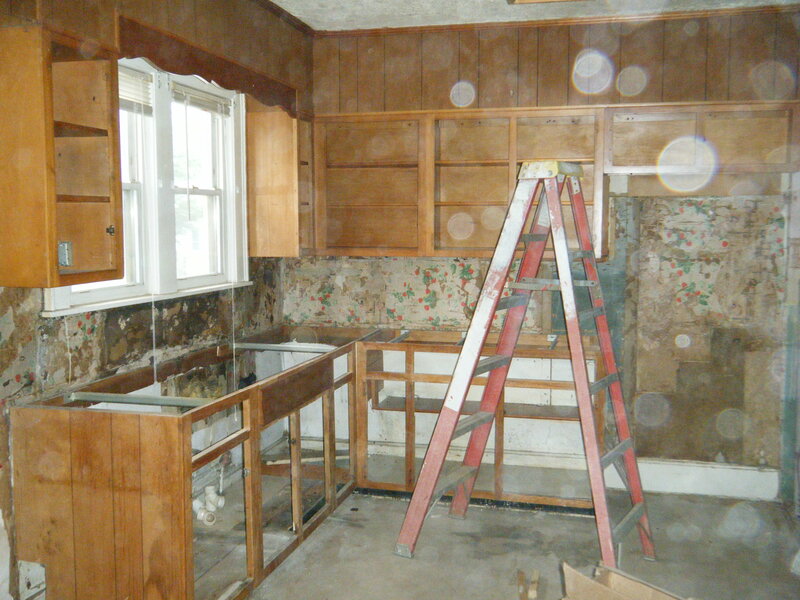 Here’s the kitchen before. 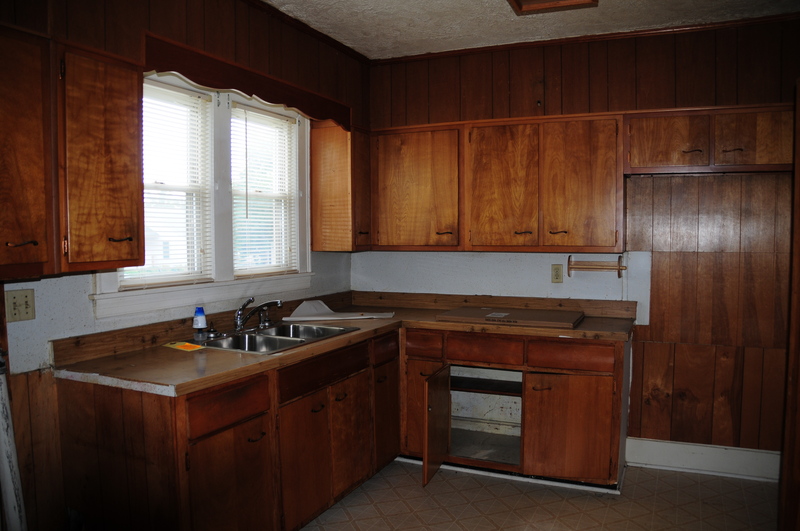 The cabinets were covered in an inch of grease build up. There floor was rotten under the dishwasher and the counter was covered in a faux wood grain contact paper. 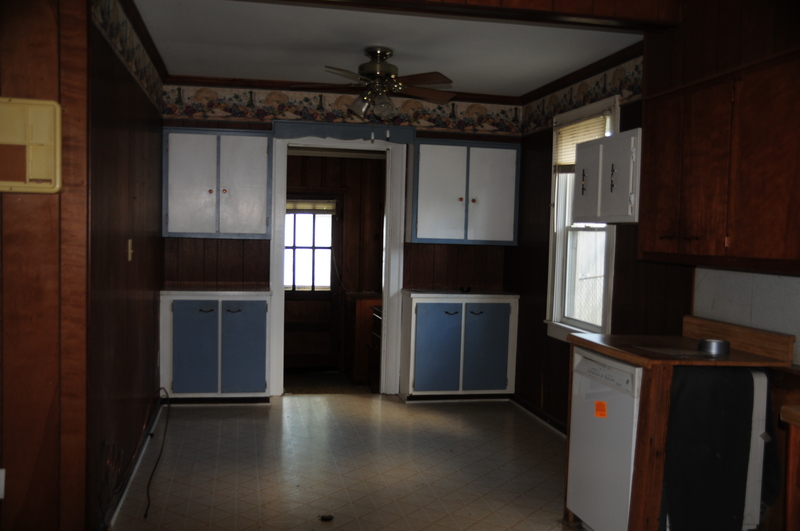 The kitchen was nice sized; large enough for an eat-in dining area, but the two-tone paint job on the extra cabinets, dated wallpaper border, and broken dishwasher had to go! So we removed this old closet and utilized the space where the old stove used to be in order to install brand new HVAC in the house. Notice the lovely vintage wallpaper layers in the closet! 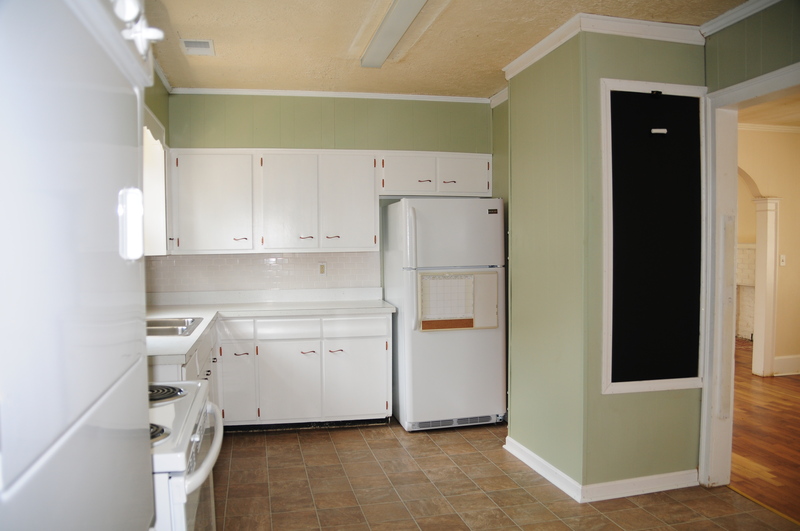 In the meantime, we removed the cabinet doors and gave them a good painting. I painstakingly removed all the cabinet handles, soaked them in TSP to remove the grease, spray painted them with Rustoleum hammered metallic paint, and re-installed. 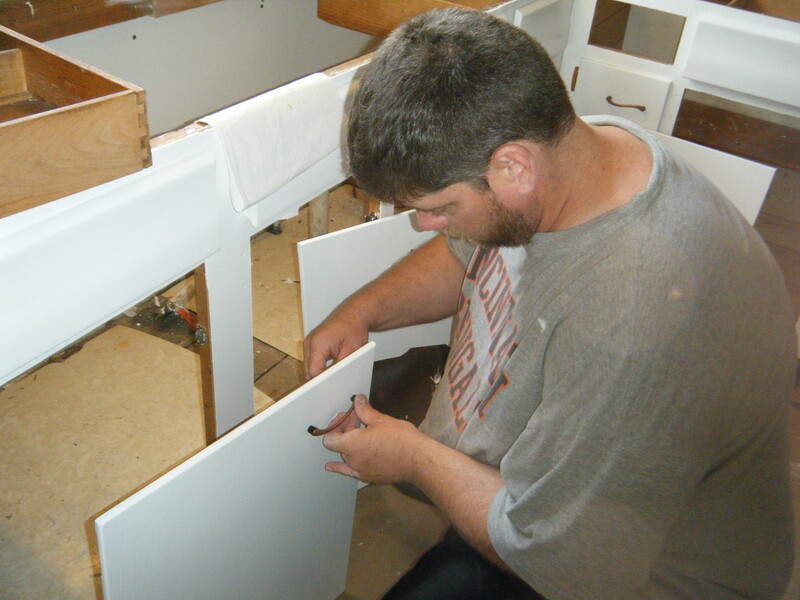 Chaddy Daddy putting the humpty dumpty cabinets and pulls back together again. 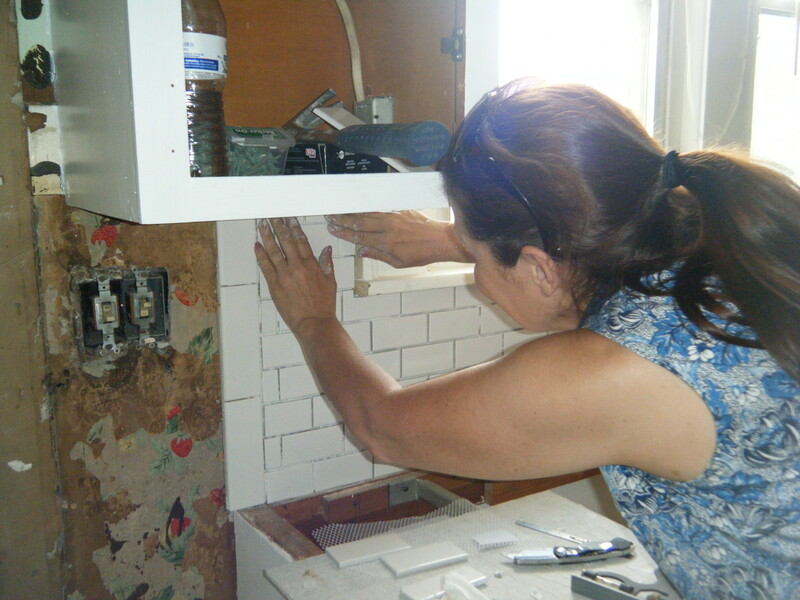 Then, I enlisted my amazing Do-It-Your-Selfer Mother, Bulldog Murphy Martina, to help me with the subway tile back splash. 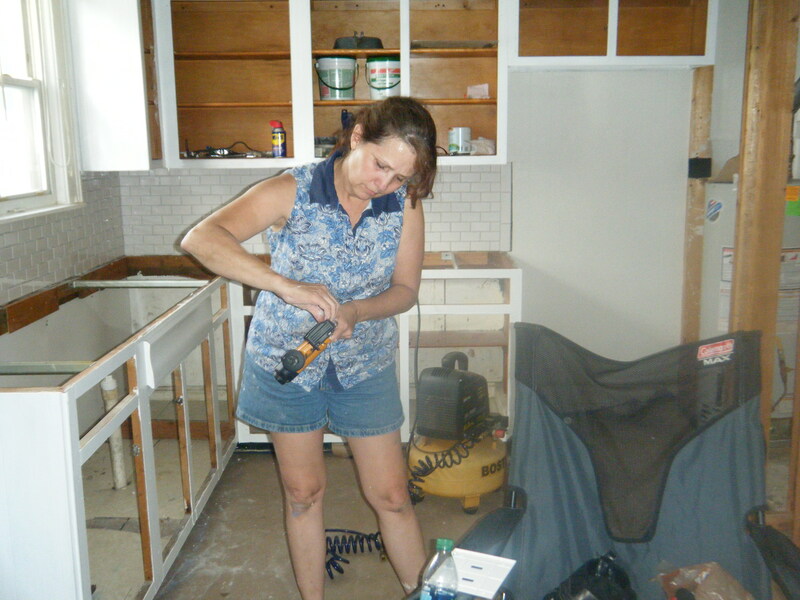 With HGTV as her teacher and sheer willpower and determination like no other, she has single-handedly remodeled her adorable century-old farmhouse (multiple times) and guided me through one other kitchen remodel and bathroom tiling job to date! Go Mom! 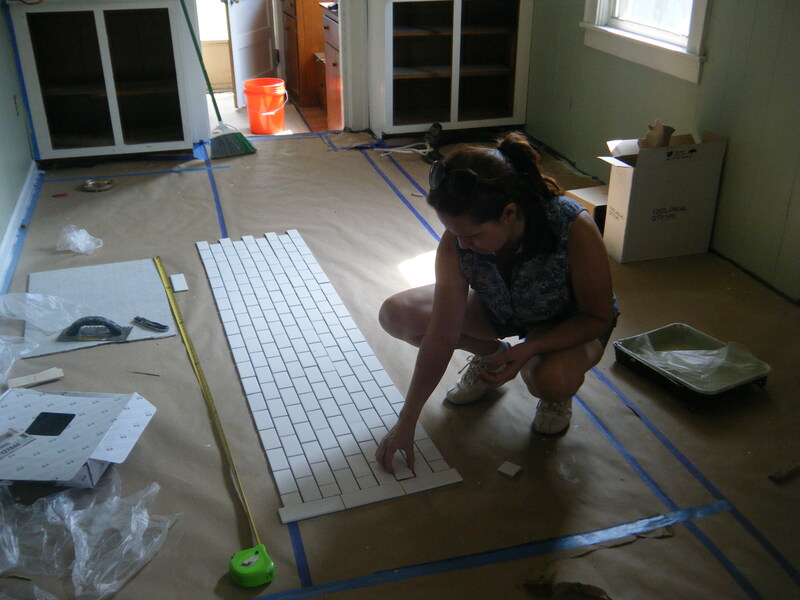 She taught me to measure and lay out the tile design on the floor before installation. The we installed the back splash tile carefully in sheets. 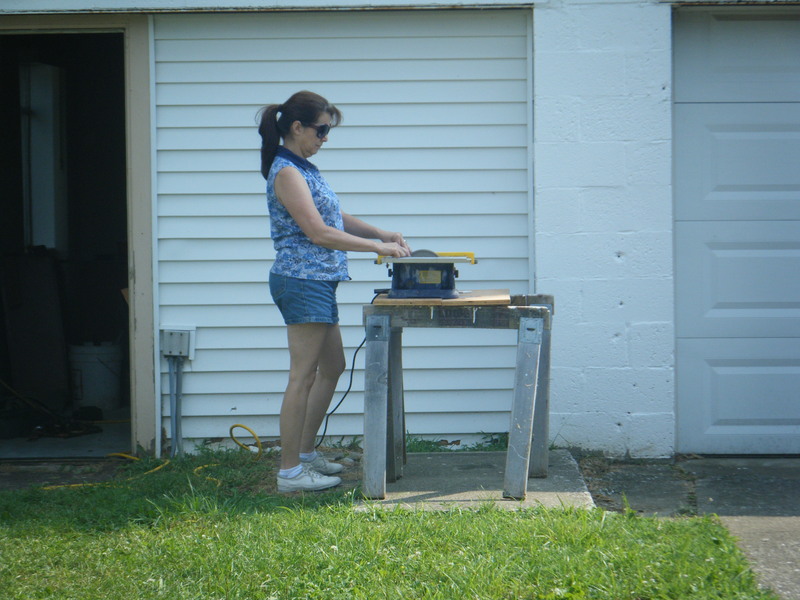 She’ll probably kill me for posting these pictures on the internet, but there’s nothing more inspiring for a daughter than your Mom wielding a power tool! So here’s how all our hard work turned out in the kitchen! We installed an access panel for the HVAC unit painted with black chalkboard paint so the tenant could make quick grocery lists and other notes. My wonderful Father-In-Law, Bee, helped us with the electrical upgrades and installation of the new, yet simple, kitchen light. Thanks Bee! I sacrificed the dishwasher in order to install a washer / dryer combo. 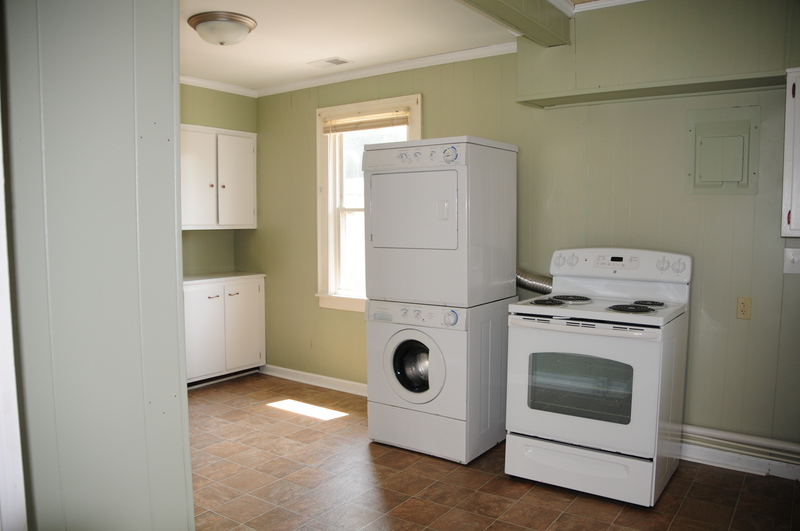 I had to choose between the two due to budgetary restraints at the time and felt like having a washer / dryer would be an added bonus for a tenant. Maybe a dishwasher could be added in the future. So that’s all we could do this time. It was so much work and I did so many things backwards. It was a great learning experience and I am happy for it, but I am not looking forward to any more house flips in the future! Thanks for looking and let me know what you think!